My Guardian Angel has a hard job. In fact, I'm pretty sure there's a reserve squad on call to protect me from my own stupidity. "Stop philosophizing and pay attention to the road!" Wait, that's not my guardian angel. That's my wife. Although she gave up saying that a long time ago. Instead, whenever we're in the car together, she drives. More and more these days, that voice would be John Paul. (Although both of them are more gentle in the way they say it.) John Paul says things like, "um...Daddy, what is the speed limit on this road?" Ah yes! Speed, car, road...got it! How do our angels watch over us? There is much here that is mysterious. But our guardian angels are our friends. They are part of that great family constituted by God's loving embrace--that vital communion in which God enables us to love Him and to love one another. They help us every day in so many ways that we never notice. They will help us even more if we ask them. God expresses His love for us in a great chorus of relationships. Certainly, everything is accomplished by Jesus Christ. But the participation in His particular love for my life--by my wife, children, family, friends, Mary, saints, and angels--is not something that diminishes His love. On the contrary, it shows that His love for me is so powerful that it generates the love of others. God wants us to recognize, love, and rejoice in all of His creation, and above all in the wonder of created persons--human and angelic too--who are made to reflect His love in the mystery of their own freedom. I pray to my guardian angel (and those of my wife and children) every day. 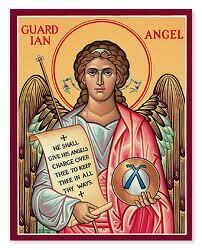 We pray to our guardian angels in our family prayers each night. I know that my angel helps me very much. His work, nevertheless, is almost entirely woven into the environment of ordinary life. We're not talking about flashy, visionary displays. We're talking about help to live life, and strength to face its challenges. The work of the angels is carried out mostly in that vast realm of ordinary life that escapes our conscious awareness. We know that, among other things, it is their task to fight against sinister spiritual powers that are opposed to us, and that seek to destroy us. The good angels take care of us as instruments of Jesus, and their protection is a gift that comes from His victory over evil and sin. Let us not take this "for granted." Rather, let us rely upon it. Let us invoke the holy angels with confidence and gratitude. Let us love them as brothers and friends, for they are devoted to Jesus, and they are companions in our lives to help us on our mysterious journey toward God, through Jesus in the Church.